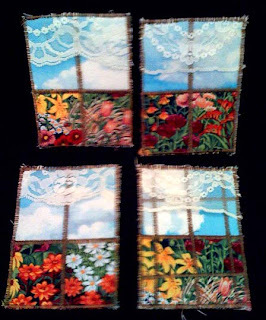 I made this mini art quilt after reading the book Art Doll Adventures by Lisa Li Hertzi. 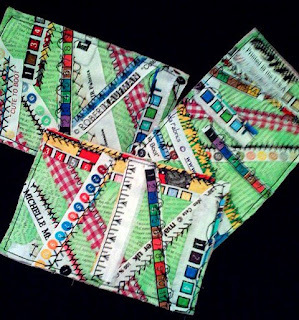 In the book she suggests a creativity exercise called "Make A Fabric-Scrap Color Wheel"
A few months ago I read an article in Sew Somerset about a house that was made from Artist Trading Cards- it was so cool we had to swap it in our postcard exchange group. We have 8 people in our group so we each will mail three windows, make a door to keep and I made a roof for each person in the group. Looking forward to seeing all the different houses everyone makes. Will post photo's of mine when all the ATC's arrive. These are the postcards that I made to trade. 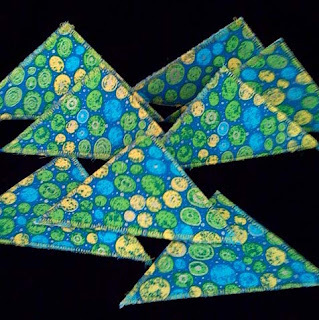 The base is an awesome lime green fabric that has newspaper print on it. 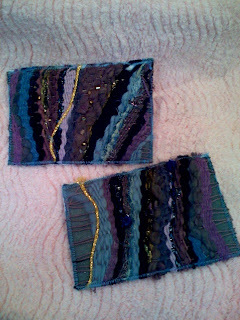 Then I used different decorative stitches to attach the salvage edges of fabrics. 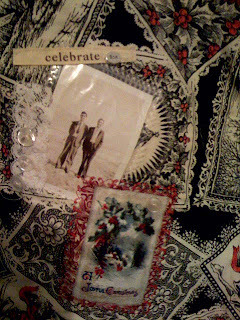 Thanks to my friend Vicki the "Wish You Were Here...A vintage postcard quilt" was born. 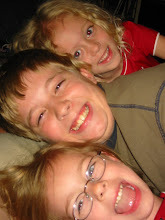 Vicki, who always knows everything that is going on the quilt community told me about Quilters Connection Challenge. Quilters Connection of Dallas issued a challenge to make a quilt that was a minimum on 36" X 36", using any technique, with at least half of the top made from a black toile fabric from the fabric line Traditions by Sentimental Studios for Moda Fabrics. We could pick up the fabric and entry forms the first week in August first and it has to be turned in by August 30th. The quilt show will be in their shop from Sept 1-6 and viewers choice will determine the winners. How could I not enter a quilt...moda has awesome fabrics, the fabric is a black toile POSTCARD and have another opportunity to use up some more of the goodies that came from the Houston Quilt Show. The Houston Quilt Show basket is getting smaller by the week. This quilt was really fun to work on. 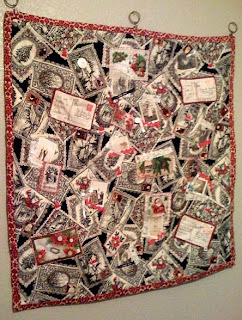 From far away it looks like an appliqe Christmas quilt but when you are closer you can see stamped and tea stained "vintage" postcards with actual 1cent stamps. Little Debbie Mum postage stamps were sewn into the corners of the postcards, and Tsukineko inks were used to color in all the berries. 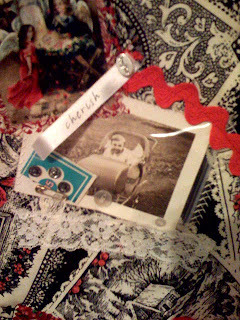 Vintage photos behind plastic with little buttons, beads and trims. 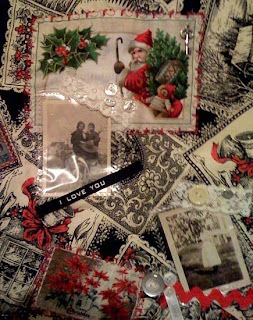 Vintage lace, rick rack and buttons also adorn the quilt. My favorite photo is on the bottom right. It is of a baby in a little carrage under the plastic are some tiny, tiny buttons and tiny, tiny pins that were given to me by mom that were in Nana's sewing box. I am so excited I can't stand it!!! My registration for the Houston International Quilt show arrived today....You would have thought it was Christmas. Mom and I started the tradition of going to the Houston Quilt show last year. It is so hard to book reasonable hotel rooms we booked last year for this year. My mission at the quilt show is easy...take classes that are not available locally and buy fabric, embellishments etc that are also not available locally. The focus is usually on purchasing "basic" kits to make one of something. Figure after making one if I wanted more it can always be ordered later online. Okay so here are my 2008 Houston Quilt Show Classes...so excited that typing is hard..
Everything You Wanted To Know About Needle Felting by Barbara Crawford. Mixed Media Miscellany #1- this class I am most excited about. You go into a huge room and each artist has a table set up and talks about their topic. Patt Blair - Drawing and Painting for People who do not Draw or Paint! Mixed Media Miscellany #2- Wicked excited about this one too! 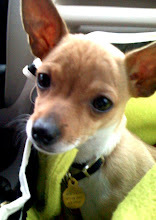 Brett Barker—Zooming In: I’m Ready for MyClose-up! 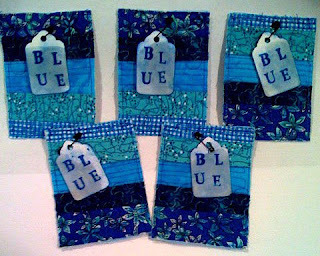 Blue QTC- Quilters trading cards I made to exchange with postcard pizzazz. They are made from quilted fabrics. The fiber girls I made to exchange with. Postcard Pizzazz. The girls were hand drawn, then made into a plastic template. 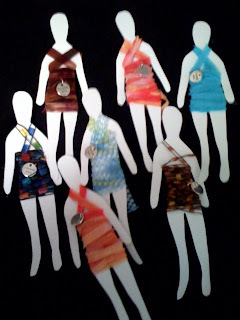 I traced the template onto card stock to make the paper dolls. Then wrapped 3 yards of different yarns/fibers and added a little charm. Hope everyone who exchanges with me likes their new fiber gals. Green ATC or QTC depending on what you want to call them. The cards are 3 1/2 x 2 1/2". 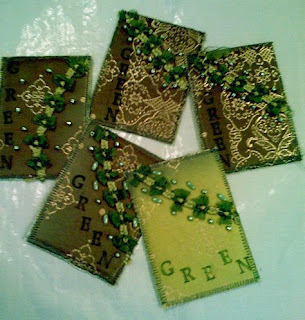 Each card was made with a variegated green silk fabric base. 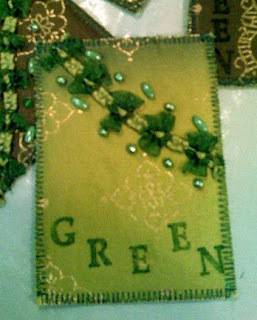 To that a vintage green ribbon and beads were hand sewn on. Then each card was stamped with the word "Green" with pine Fabrico craft ink. The back of the ATC is stamped and then the edges were finished by setting my Husqvarna Viking Designer SE 4.5 width and 2.0 length with the zig zag stitch. You can set the stitch to a 0 and it is really close together but I like the rough looking edge where the silk fabric shows through. Postcard Pizzazz - my yahoo postcard exchange group will celebrate its one year anniversary on August 25th! 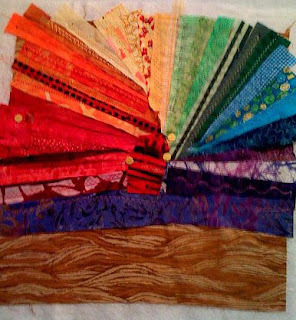 Two threads of friendship fabric postcards made by pinweaving fibers.